Aycliffe’s first team had a welcome return to form with a brilliant two wicket victory away at league leaders and previously unbeaten Wolviston 1st XI. Wolviston 1st XI v Newton Aycliffe 1st XI – weather was warm and sunny. Aycliffe won the toss and chose to bowl first. Chris Palmer 37, Graham Telford 21 and Jack Slatcher 12. 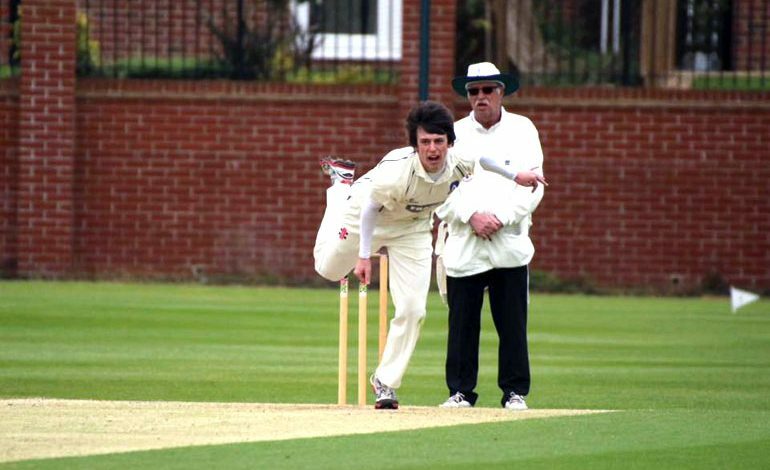 Aycliffe’s first team had a welcome return to form with a brilliant two wicket victory away at league leaders and previously unbeaten Wolviston 1st XI. Patrick Howe (sponsored by Tom Steel, pictured above) was given the man of the match award for an outstanding spell of leg spin bowling. The talented 19 year old (photo attached) bowled a lengthy 13 over spell and finished with the extraordinary figures of four wickets for just 12 runs and then later in the game, scored the winning runs in a very tense finale. The win boosts Aycliffe’s points total to 116 from 12 games played and opens up a gap from the clubs currently sitting in the bottom two relegation places. Newton Aycliffe 2nd XI v Blackhall 2nd XI – weather was warm and sunny. Aycliffe won the toss and chose to bowl first. The second team were well beaten at home by 216 runs against unbeaten table toppers Blackhall 2nd XI. Late replacement Michael Tribley was given the man of the match award for some good work in the field for Aycliffe.